Ministry of Civil Aviation is in process of placing an order for 10 HAL built 19-seater Dornier 228 Civil Variant to be used for civilian flights. 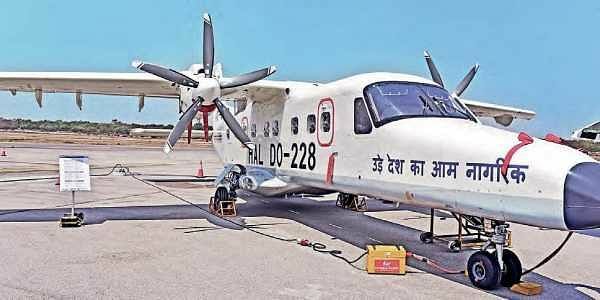 Directorate General of Civil Aviation (DGCA) already has given a certificate of airworthiness to HAL’s Dornier 228 and second Civil variant also took to air in February to further fast-track the process. Highly versatile multi-purpose light Dornier 228 is already generating interest also from Private domestic airline players in the market and to implement Modi’s government’s ambitious UDAN scheme to improve regional connectivity, domestic airlines are also likely to place orders for the aircraft soon. 19-seater Dornier 228 is a non-pressurised plane has a maximum cruise speed of 428 kmph and a range of 700 km. HAL now plans to sell this plane for civil use in neighboring countries such as Nepal and Sri Lanka.